The three-hour session saw a massive 2,526 laps completed as a preview for Sunday’s running of “The Greatest Spectacle in Racing.” Karam, who will make his fifth Indy 500 start and fourth with DRR, recorded the day’s hottest lap of 226.461 mph early in the session in the No. 24 DRR Chevrolet. “I ended up P1, which is cool and all,” said Karam, a 23-year-old resident of Nazareth, Pa. “It doesn’t really mean too much, though. We have some work to do for the race. The main goal for today was to work on the race car and work on pit stops. I haven’t done pit stops since last May. We got those done and did some traffic runs to make the car better. For “one-off” drivers like himself, Karam reiterated that Monday’s session in INDYCAR’s new-for-2018 Dallara universal chassis featuring less downforce was more important for data gathering than this Friday’s Carb Day practice. Sage Karam topped the time sheets at Indy on Monday. “Today was like you took everything that you’ve already learned earlier in the week, just kept going with it,” Karam said. “Usually on Carb Day you get to run a little bit, but you don’t want to risk much. I think the last three Carb Days I’ve done, I’ve only done a total of 15 laps combined. You won’t really do too much running unless you have serious issues and need to fix your car. For the most part it’s just systems check. So this is the last real race practice you get. “It’s encouraging to know that my car felt pretty solid under me in traffic. I’m kind of used to having to come from the 20s (on the grid), try to work my way up. I just know it’s going to be a little bit more difficult this year. I don’t think you’re going to be able to see…like, the guys how I’ve come through the field before, I think it’s going to be a lot more challenging. I don’t think you’re going to be to see (Alexander) Rossi do it with me. There are some real good guys in the field that are in the back. They’re going to have trouble, I think, getting to the front. “You’re just not going to see guys carving through like you used to. You’re going to have to do it in a smarter way, you’re going to have to think outside the box. You’re going to have to really out-drive the people in front of you. We’ll see what we can do. It’s hard to tell. When you’re out there running in traffic, you don’t know who has what fuel loads, what tires, anything like that. So everything really changes when you get to the race. Popular Brazilian Tony Kanaan, the 2013 Indy 500 champion making his 17th start in the race, was second-fastest with a late lap of 225.123 mph in the No. 14 AJ Foyt Racing Chevrolet. The 21-year Indy car veteran is in his first season with the team owned by four-time Indy 500 champion A.J. Foyt Jr. The 60-minute Carb Day practice is the final chance to prepare for Sunday’s 200-lapper. Team Penske’s Will Power and Helio Castroneves were the day’s busiest drivers. Power, a native of Australia and the 2014 series champ, turned 120 laps in the No. 12 Team Penske Chevrolet while posting the sixth-best lap at 224.507 mph. Three-time Indy 500 champion Castroneves logged 118 laps and was seventh-fastest in the No. 3 Team Penske Chevrolet at 224.368 mph. Castroneves, also of Brazil, finished second to Takuma Sato of Japan last May in his ongoing bid to join A.J. Foyt Jr., Al Unser and Rick Mears as the only four-time Indy 500 champs. Hometown hero Ed Carpenter, who captured the Verizon P1 Award pole position in qualifying on Sunday, was 14th on the speed chart in the No. 20 Ed Carpenter Racing Chevrolet at 223.573. Carpenter completed 100 laps, or half the race-day distance. Rookie driver Robert Wickens was involved in the day’s only incident after three laps. Wickens, driver of the No. 6 Schmidt Peterson Motorsports Honda, drifted into the SAFER Barrier exiting Turn 2. The car continued down the backstretch as it decelerated before making a sharp right turn and hitting the outside wall nose first. Wickens was not injured. 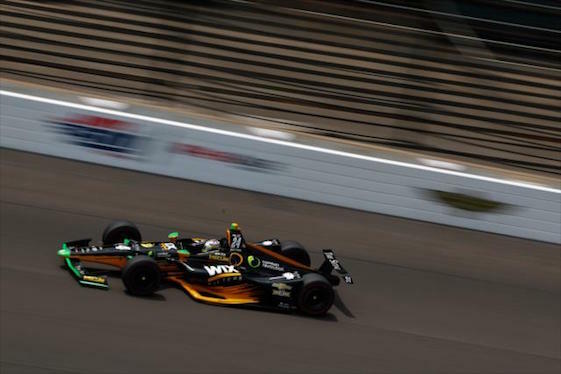 Wickens’ teammate and fellow-Canadian, 2016 Indy 500 pole-sitter James Hinchcliffe, failed to make the 33-car field during Saturday’s first qualifying session. Practice on Carb Day starts at 11 a.m. (EDT) Friday and will air live on NBC Sports Network. 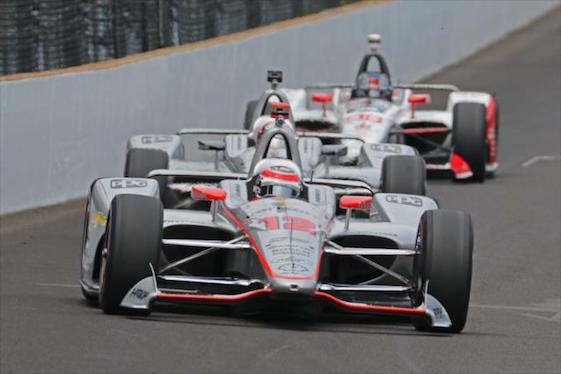 The 102nd Indianapolis 500, sixth of 17 races on the 2018 Series schedule, airs live on ABC-TV and the Advance Auto Parts INDYCAR Radio Network beginning at 11 a.m.
Sanctioning body INDYCAR has approved a new engine configuration that will make its debut in 2021. The revised 2.4-liter, twin-turbocharged V-6 engine is projected to generate at least 100 more horsepower than the current 2.2-liter platform, with more than 900 horsepower achieved in the 2.4-liter formula when using push-to-pass overtake activation. In an effort to provide stability for the Verizon IndyCar Series and its competitors, the engine regulations will be in-place for six years, through the 2026 season. INDYCAR has utilized the 2.2-liter, turbocharged V-6 formula since 2012, with exclusive use of twin turbos since 2014. Engines will continue to turn at a maximum of 12,000 RPM. On-track testing is scheduled to begin in the summer of 2020. “Our drivers have been asking for more horsepower and thanks to the hard work of Chevrolet, Honda and the INDYCAR engine group, they’re going to get it,” said Jay Frye, INDYCAR president of competition and operations. Executives from Chevrolet and Honda said the new configuration suits their corporate technical and marketing requirements. Art St. Cyr, president of Honda Performance Development, said the formula will provide “an interesting technical challenge” for the manufacturer. An appearance on “The Tonight Show,” meetings with Congressional and Japanese officials and a journey to the newest city on the IndyCar Series schedule are among the myriad activities the 33 drivers competing in this year’s Indianapolis 500 will encounter during the annual North American Media Tour before the race. In what has become another Indy 500 tradition, the 33 qualified drivers and one special guest driver are fanning out to 21 cities over 24 hours, spreading the word about Sunday’s 102nd Indy 500. Drivers will meet with national and local media to discuss the race and join in activities to increase awareness in the world’s largest single-day sporting event at Indianapolis Motor Speedway. Media and fans can follow the media tour on social media as drivers and the Verizon IndyCar Series use the hashtag #Indy500MediaTour to record the adventures. Danica Patrick, who will start Sunday from the third row in the last race of her gender-breaking career, will travel to New York City where her tour will include an appearance on “The Tonight Show Starring Jimmy Fallon” to air at 11:35 p.m. (EDT) Tuesday on NBC. Patrick is the first woman to win a major open-wheel race (Twin Ring Motegi Japan, 2008), first woman to lead the Indianapolis 500 (as a rookie in 2005) and the highest female finisher in Indy 500 history (third place, 2009). Joining Patrick in Manhattan will be reigning Indy 500 champion Takuma Sato, who last year became the first Japanese driver to win “The Greatest Spectacle in Racing.” Sato will be honored Tuesday at a private event with three Japanese diplomats, including Consular General Reiichiro Takahashi, who will offer a toast. James Hinchcliffe, the 2016 Indianapolis 500 pole-sitter and one of the most popular drivers in the series, also is traveling to New York for media events. Although he failed to qualify for this year’s Indy 500 in heartbreaking fashion on Saturday, the Canadian continues to attract wide attention as he promotes the race. Ryan Hunter-Reay, the 2014 Indianapolis 500 winner and 2012 series champion, is headed to Washington, where he will meet Tuesday with political movers-and-shakers in a special reception hosted by the Indiana Society of Washington. Expected to attend are members of Indiana’s Congressional delegation. Alexander Rossi, the 2016 Indy 500 winner as a rookie, was headed to Portland, where he was scheduled to visit the World of Speed Motorsports Museum in nearby Wilsonville, Ore., on Monday night to talk about the race. Californian Rossi also previewed the Grand Prix of Portland on Labor Day weekend that will mark the return of INDYCAR to the Pacific Northwest for the first time since 2007. Indiana’s Ed Carpenter won the Indy 500 pole on Sunday as fastest qualifier for a third time in his career and will lead the field to the green flag to start the race. Carpenter, who holds the unique dual role of driver and team-owner, will travel to Detroit _ site of the Chevrolet Detroit Grand Prix presented by Lear, the doubleheader race weekend that follows the Indianapolis 500 on the schedule by one week.